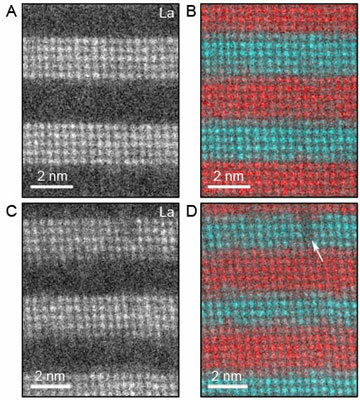 (Nanowerk News) Using cutting-edge spectroscopy at atomic resolutions, researchers have discovered how to grow ultra-thin manganite films while retaining their magnetic properties. Materials do funny things at the nanoscale. A metal oxide complex called lanthanum strontium manganite is ferromagnetic in large quantities. But scaled to nanometer thickness, it becomes an insulator and loses much of its ferromagnetism. Same material, different behavior. Using cutting-edge spectroscopy at atomic resolutions, researchers led by David A. Muller, professor of applied and engineering physics, have figured out why this happens, and how to grow ultra-thin manganite films while retaining their magnetic properties. Perfecting such a technique could pave the way for manganites and other oxides to replace silicon in thin-film electronics, memory storage and other technologies. The work is detailed in a paper published online June 14 in the journal Proceedings of the National Academy of Sciences ("Microscopic origins for stabilizing room-temperature ferromagnetism in ultrathin manganite layers"). "A number of research groups have grown these thin layers before, and their results suggested that there is a 15-atomic-layer critical thickness, below which you could not get it conducting," said postdoctoral associate Lena Fitting Kourkoutis, the paper's first author. "But we show that we can go much lower to a handful of atomic layers and still keep it conducting." The key is understanding how to grow perfect, defect-free manganite sheets. The chemical composition has to be exactly right, and even the slightest break in the crystalline lattice of the atomic layers can ruin the films' conductivity. These defects don't matter as much on a larger scale. To examine manganite samples grown by their collaborators in Japan, the scientists used a technique called electron energy loss spectroscopy, performed in a scanning transmission electron microscope. They employed a technique (described in a 2008 Science paper) called aberration correction, which allows them extreme precision for imaging the composition of films only atoms thick. Manganites have good potential for the emerging field of spintronics, which exploits materials' electron spin and magnetic moment for use in memory storage technologies.